After the interminable slog of the first half hour and before the terribly uninspired final confrontation with the forgettable villain (who has all the charm and makeup of a rejected vampire extra from Buffy season 1), there is about an hour in which an unleashed Nic Cage, a funny Eva Mendes, a one-liner spouting CGI skull that would have been embarassed to show its face in Quake III, and Sam Elliott's glorious mustache all come together to produce some surprisingly watchable schlock. It's hard for me to hate a movie where Nicholas Cage seems to be having a lot of fun. The problem is that he isn't on-screen enough and some terrible, even for the time, effects take up the screen in his place. 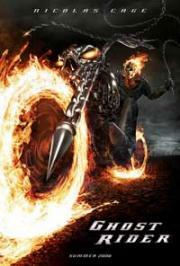 Ghost Rider is just not very memorable. However, if you're looking for a Pre-MCU Superhero film that is a little darker than the overall bulk, it works just fine. Nic Cage doesn't shine by any means. If anything he appears held back. The special effects and Rider scenes are cool and the atmosphere is consistent and enjoyable.